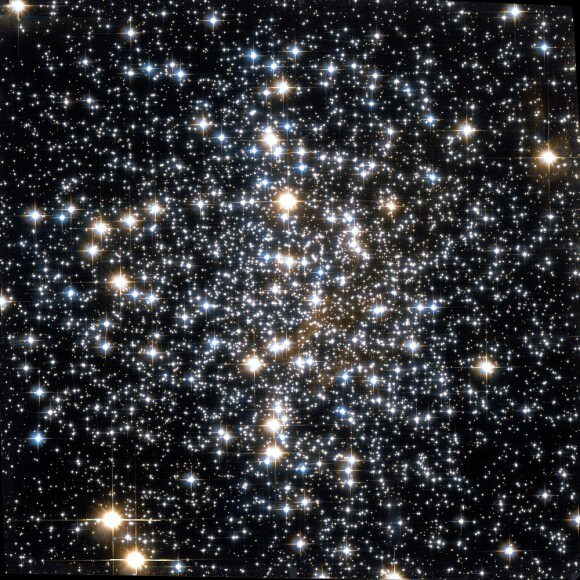 M4 is one of the most open, or loosely constructed of globular clusters, as its high-classification of IX indicates (the higher the number, the less dense the cluster). Its central mass measures about 8 light years in diameter, but its full reach is 75 light years across. On top of that, its gravitational influence stretches for about 140 light years. At a distance of about 7,200 light-years from Earth, M4 is also one of the closest Messier Objects to Earth (the other being NGC 6397/Caldwell 88). Based on abundance readings, it is believed that the cluster is home to two distinct classes of stars, which could indicate that M4 underwent two separate cycles of stellar formation. M4 follows an orbital path that takes it through the Milky Way with a period of 116 ± 3 million years. When passing through the disk, this cluster passes the center of our galaxy at a distances of less than 5000 parsecs. This causes it to undergo tidal shock (a gravitational perturbation) each time it passes through, which can cause the repeated shedding of stars. Thus, the M4 cluster may currently be much smaller than it was in the past. The globular cluster is home to at least 43 known variable stars and to the first millisecond pulsar ever discovered inside a globular cluster. This neutron star – known as – is rotating (and pulsating) once every 3.0 milliseconds, or over 300 times per second. This about ten times faster than the Crab Pulsar, perhaps the most famous pulsar discovered. Between 1995 and 2001, the National Optical Astronomy Observatory (NOAO) and NASA also uncovered the oldest burned-out stars in our Milky Way Galaxy within this cluster. These small, burned-out stars – called white dwarfs – are about 12 to 13 billion years old, which has given astronomers a fresh reading on the age of the universe. By adding the one billion years it took the cluster to form after the Big Bang, astronomers deduced that the age of the white dwarfs concurs with previous estimates of the universe being between 13 and 14 billion years old. Observations of the full cluster were performed by the Kitt Peak National Observatory’s in March 1995. Subsequent examinations of a small region of the cluster (measuring only a light-year across) were performed by the HST’s Wide Field and Planetary Camera 2 between January and April of 2001. These images revealed the presence of cool, aging white dwarf stars, which are circled in the image above (bottom right). Another interesting find was the binary star system which consists of a white dwarf and a pulsar companion (PSR B1620-26). This star also has a confirmed exoplanet, one which has 2.5 times the mass of Jupiter – making it a “Super Jupiter“. “A compressed mass of very small stars, in the middle of the creature’s body, with outliers and a few small stellar companions in the field. The place is carefully differentiated with Antares; from which it is only 1deg 1/2 distant to the west. This object is elongated vertically, and has the aspect of a large, pale, granulated nebula, running up to a blaze in the centre. It was discovered by Messier in the year 1764, and duly reported in the Connoissance des Temps. In 1783, Sir William Herschel resolved this object into stars; and gauging it by a modification of the method which he applied to fathom the Galaxy, he concluded that his 10-foot reflector, having the power to show stars exceeding that of the eye 28.67 times, gave the profundity of this cluster of the 344th order. He describes it as having a ridge of eight or ten pretty bright stars, running from the middle to the nf [north following, NE]; a description which I found very correct. Under the head of 80 Messier (which see, No. DLXIV ), a slight allusion was made to nebulae considered in their relations to the surrounding spaces. Like that singular mass, the group before us is also situated on the western edge of an area which contains no stars, i.e., none of which we can decry; and in such spaces invariably, according to the testimony of Sir William Herschel, are nebulae found. Finding Messier Object 4 is quite easy, given its apparent luminosity and proximity to Earth. 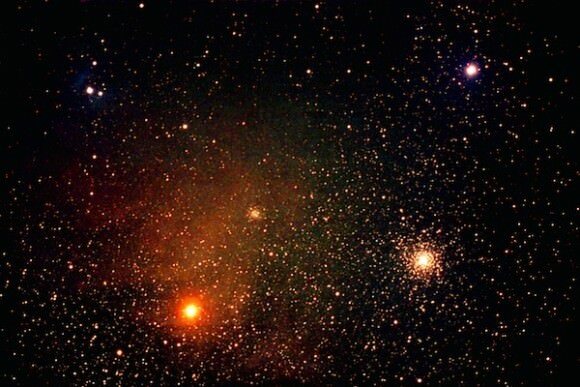 Even with the naked eye, all one needs to do is locate the red star Antares (Alpha Scorpii, aka. “the rival of Mars”), and you’ll M4 located 1.3 degrees away to the west. Even the slightest optical aid (like binoculars) will reveal this magnificent globular cluster with ease on a dark night, provided that light pollution is not a significant factor. With favorable conditions, telescopes as small as 3″ will begin resolving this huge ball of stars. With a large enough aperture, all one needs to do is look for the central “bar” structure in M4, which was first noted by William Herschel in 1783. Good luck seeking out this globular cluster, and may your view of it be clear and beautiful! 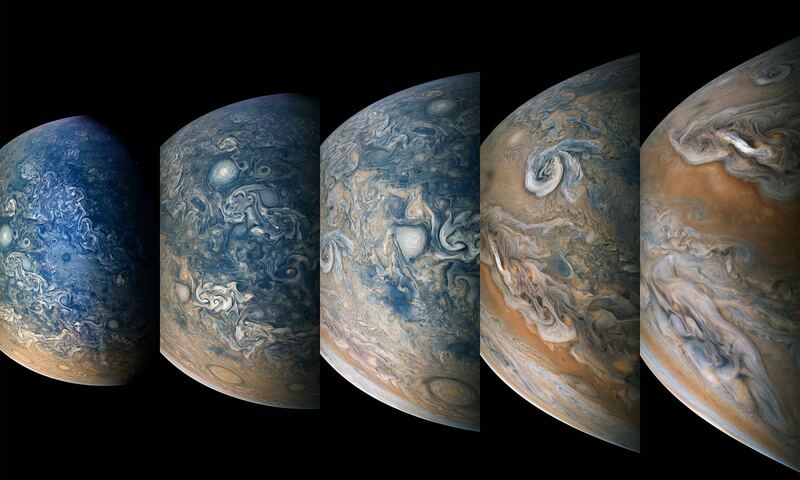 We have written many interesting articles about Messier Objects here at Universe Today. For instance, here’s Tammy Plotner’s Introduction to the Messier Objects, M1 – The Crab Nebula, and David Dickison’s articles on the 2013 and 2014 Messier Marathons.